We are pleased to bring you this Matchmaster Kit which includes the products needed to complete the incredible model as illustrated. The enclosed step-by-step instructions will guide you through each stage of construction until you finally achieve the finished product. Create a detailed matchstick models with the unique feature of moving parts. 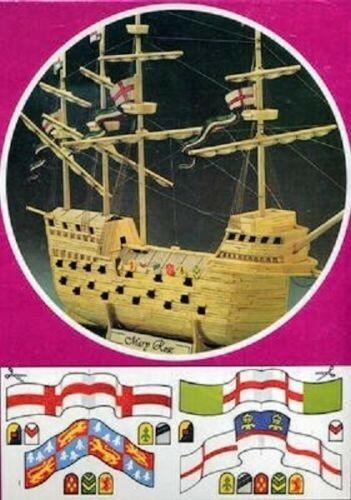 Kit contains matchsticks, pre-cut card shapes, balsa wood masts, rigging twine, sandpaper, glue, full instructions. The box does not say how big the finished product is, but the box contains 950 matchsticks so should give you a rough idea. The Mary Rose was King Henry VIII's favourite warship and he named the ship after his sister. The ship was built in 1509, the year Henry VIII came to the throne. On 19 July 1545, disaster struck the Mary Rose. The French had landed on the Isle of Wight. Henry came to Southsea Castle to watch his fleet leave Portsmouth and engage with the French force in the Solent. At the head of the English fleet was his pride and joy the Mary Rose. From his advantage point on top of Southsea castle, Henry had a commanding view of the impending battle. Unfortunately, right before his eyes he watched one of the greatest naval tragedies, the sinking of his flagship, the Mary Rose. gun port The discovery and submerging of the Mary Rose in 1982 has provided us with a unique glimpse of maritime life in Portsmouth during the reign of Henry VIII. The remains of the Mary Rose are now on display at Portsmouth Dockyard Naval Museum.